Object V774104 was discovered in late October, 2015, and is one of the most distant objects ever detected in the solar system. It appears to be about half the size of Pluto, but with an orbit two to three times larger than Pluto's. 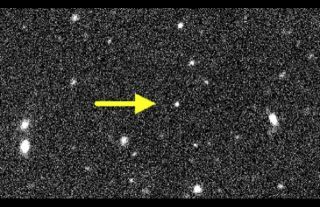 A newly found object may set a new record for the most distant dwarf planet in the solar system. The object, called V774104, lies about nine and a half billion miles from the sun, or two to three times farther away than Pluto. V774104 is a little less than half Pluto's size, and like Pluto it may move closer toward or farther away from the sun during its orbit, but those details of its motion cannot yet be determined. Meet the dwarf planets of our solar system, Pluto Eris, Haumea, Makemake and Ceres. Sheppard announced the discovery Tuesday (Nov. 10) at the annual meeting of the American Astronomical Society's (AAS) Division for Planetary Sciences. He told Space.com in an interview that V774104 is definitely one of the most distant objects ever observed, although further observations are necessary to find out if it will take home the title of most distant dwarf planet. The finding is part of a larger survey that Sheppard is doing with Chadwick Trujillo, of the Gemini Observatory in Hawaii, and Dave Tholen with the University of Hawaii. "We're doing the widest, deepest survey ever for outer solar system objects," Sheppard told Space.com. "We're using the 8-meter [26 feet] Subaru Telescope in Hawaii. We're just looking for things beyond the Kuiper Belt, beyond Pluto." Objects in the outer solar system are faint and rare, Sheppard said. To find them, the researchers are using the Subaru Telescope in Hawaii, which collects a large amount of light in a short time, and can scan large areas of the sky fairly quickly, which Sheppard said is a crucial combination for finding these hidden gems. Beyond the orbit of Neptune is a band of cold, icy bodies (including Pluto), called the Kuiper Belt. Pluto is about 3.67 billion miles from the sun, but regions of the solar system are more commonly talked about in "astronomical units" (AU), which is the distance from the Earth to the sun, or about 93 million miles (150 million kilometers). Neptune is, on average, 30.1 AU from the sun; Pluto orbits between 29 and 49 AU. If the measurements of V774104 are correct, it currently lies 103 AU from the sun, which would place it in a region called the inner Oort Cloud. The Oort Cloud is a sphere of icy, rocky objects that wraps around the solar system. The dwarf planet Eris orbits the sun in the inner Oort Cloud, at a distance that ranges from 37 to 97 AU. The dwarf planet Sedna, discovered in 2003, has an incredibly eccentric orbit, such that it can be anywhere between 76 AU and about 940 AU from the sun. Last year, Sheppard and Trujillo discovered an object similar to Sedna called 2012 VP113 that orbits between 80 and 452 AU from the sun. Sedna and VP113 are far enough away from the inner solar system (Earth's local neighborhood) that they are not affected by the gravity of the system's eight planets, according to Sheppard. "Sedna and VP113 are the only objects known to be completely decoupled from the giant planet region," Sheppard said. "And yet they have very eccentric orbits, and so that's why we find them very interesting. Because their orbits, from what we currently know about the solar system — they should not be perturbed at all. They couldn't have formed in those orbits. Something disturbed them." This is the motivation behind Sheppard and Trujillo's survey of the distant solar system. They're looking for objects that have been undisturbed since the early days of the solar system and thus behave the same way they did shortly after the solar system's formation some 4.6 billion years ago. Sheppard said a leading theory about the solar system's formation suggests that the sun was born in a "very dense stellar environment, where a bunch of other stars were forming around it." The gravitational pull of those stars might have been what perturbed the orbits of objects like Sedna, Sheppard said. Then again, it could be that some massive, as-yet-unknown object far, far beyond Pluto is responsible for the gravitational force disturbing these inner Oort Cloud objects, he added. "Some of these inner Oort Cloud objects could rival the size of Mars, or even Earth," Sheppard said in a statement announcing the discovery of VP113. "This is because many of the inner Oort Cloud objects are so distant that even very large ones would be too faint to detect with current technology." The answer could be found by studying enough objects in this outer region. "We want to find a bunch of these objects like VP113 we found last year," Sheppard said. "There's several different theories about how these distant objects could have got out there on these eccentric orbits. And all these different theories predict different orbital distribution and orbital population. So if we can find 10 or so of these objects, then we can start determining which theories of the formation of these objects are correct." This story was brought to our attention by various publications reporting from the AAS meeting.